Can you think of a healthy, delicious, gourmet and super easy dinner that consists of only 6 ingredients? It’s not a very easy task, but when you combine the right 6 ingredients with a few simple cooking techniques, you have perfection! As part of the AMEX Dinner @6 Contest (part of the Foodbuzz Tastemaker Program), I put together this fantastic dinner. 1. 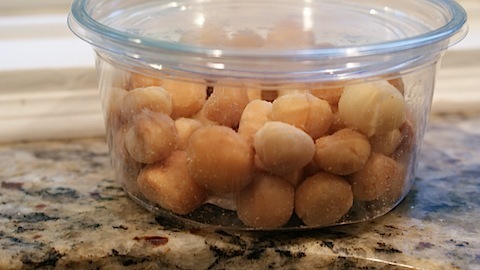 Salted Macadamia Nuts: They are rich, flavorful and full of amazing texture and taste. They also pack a healthy dose of fat and crunch. 2. 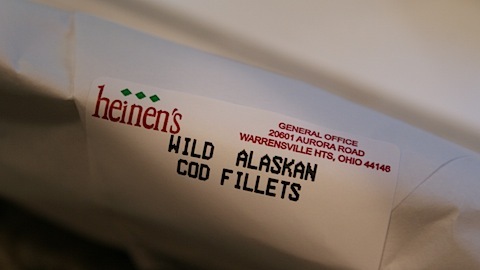 Wild Alaskan Cod: This meaty white fish takes on any flavor while staying firm and fresh tasting. 3. 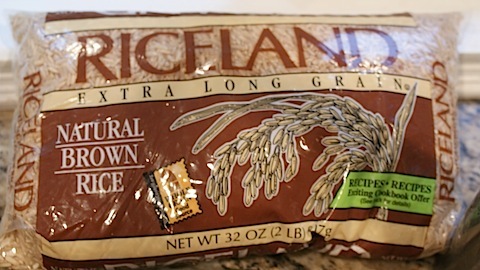 Brown Rice: Full of fiber, brown rice takes on flavor and is easily enhanced with other ingredients. 4. 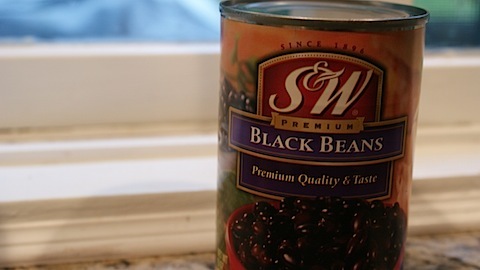 Black Beans: Not only are black beans rich in protein, they are great for digestion. 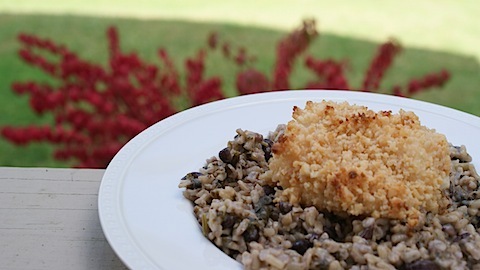 Black beans and rice pair to make a creamy flavorful and healthful side. 5. 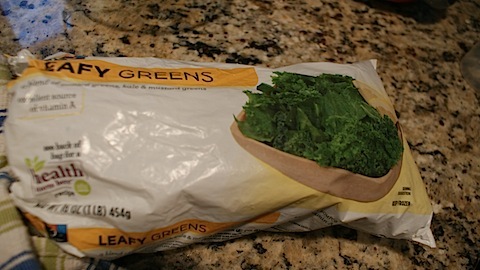 Frozen Leafy Greens: This bag contains a mix of kale, spinach, swiss chard and mustard greens. Any one of the greens listed above would also work in the dish, but I like the combination. The greens add major health value, vitamins, and another texture to the dish. They complete the meal. 6. 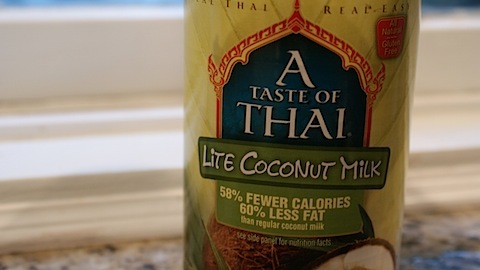 Lite Coconut Milk: To tie this dish together and make it rich, creamy and exotic, I chose coconut milk. 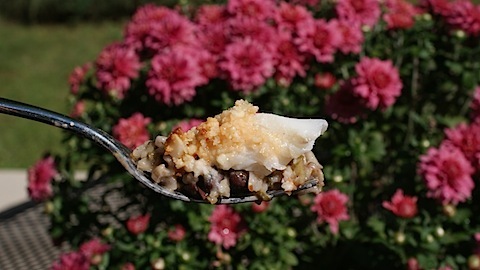 The flavor of coconut is mixed throughout the rice and beans, and also with the sweet and salty fish/nut combination. In a rice cooker (or large pot), mix black beans, greens, 1 cup. coconut milk, brown rice, frozen leafy greens and 1 cup of water. Add a good helping of salt and pepper. Set and turn on rice cooker. 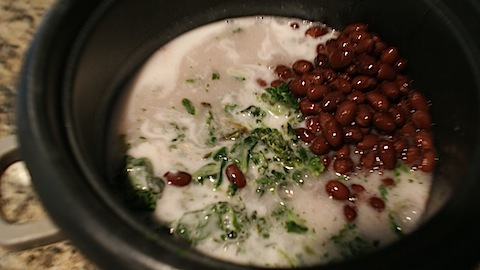 While rice/beans are cooking, pour the remaining coconut milk into a small bowl. Pour the cup of crushed macadamia nuts into a separate bowl. 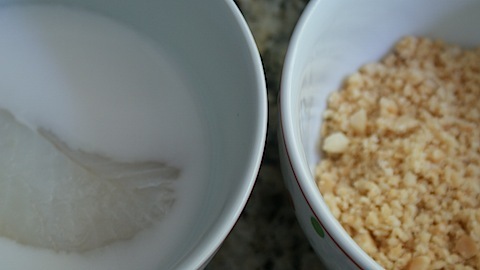 Dip each piece of fish into the coconut milk then the macadamia nuts and place the encrusted fish onto a baking dish. Bake the fish at 425 for 15-20 minutes, until fish is cooked through and nuts are golden brown. When rice/beans are done, place a serving on a plate. 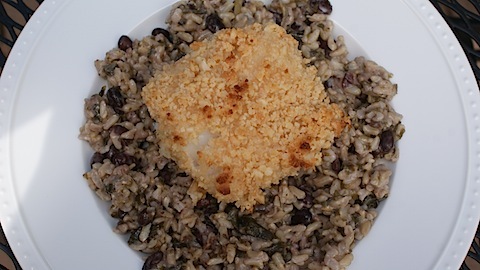 Top with warm, nut crusted fish. The finished product is a rich and creamy dish filled with healthy fats, fiber, veggies, protein and flavor. It’s the perfect dish to make for a movie night or a fancy dinner party! With the help of the rice cooker, this dish comes together with only 3 dirty dishes and less than 30 minutes! It would taste great paired with a fun Caribbean cocktail or a warm fall beer. Anyone from 1 year olds to grandparents can enjoy the light yet rich flavors of this meal. Next time you come over for dinner, I will make it! As part of the Foodbuzz Tastemaker Program, I received an American Express gift card. As part of the Dinner@6 contest sponsored by Blue Cash PreferredSM, American Express provided me with a $100 gift card to give out to one lucky commenter. 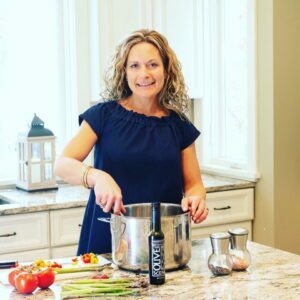 What is your favorite six-ingredient recipe? That sounds delicious! Hope you win!! Throw 1/2 bunch of cilantro on top and cook on low for 8 hours. Use for tacos or burritos. My favorite six ingredient recipe is trail mix…lol, you know I can’t cook! Hmmm…can I choose this recipe as my have 6 ingredient? It looks fabulous! I can’t think of any recipes, I’m not much of a cook and try to stick to 2-3 ingredients! 1 12 oz can beer. Bake at 350 for 30-40 minutes. Brush 3 Tbsp melted butter when it comes out of the oven. This sounds delicious and I’m not a fish fan! I’m wondering if you could make it with chicken? I want this right now! I miss you too! We need a phone date so I can hear about all of hte amazing things you are up to! Also, are you going ot Foodbuzz? Sure you can choose this recipe Becca! I agree with 2-3 ing. dinners too! It’s great to do a meat/chicken/fish/bean with a marinate, veggie and a rice or pasta! Dinner is done! hahahhaa, I love this! I am going to call you on Tues. You can give me your recipe then! And CONGRATSSSSSSS! Didn’t listen to your message until today! This sounds fantastic! I am going to make this for Brady next week! Hi! Yes! Dinner, my house soon!! You were out of town last week I heard! We need to plan another dinner ASAP! Good luck tomorrow!! 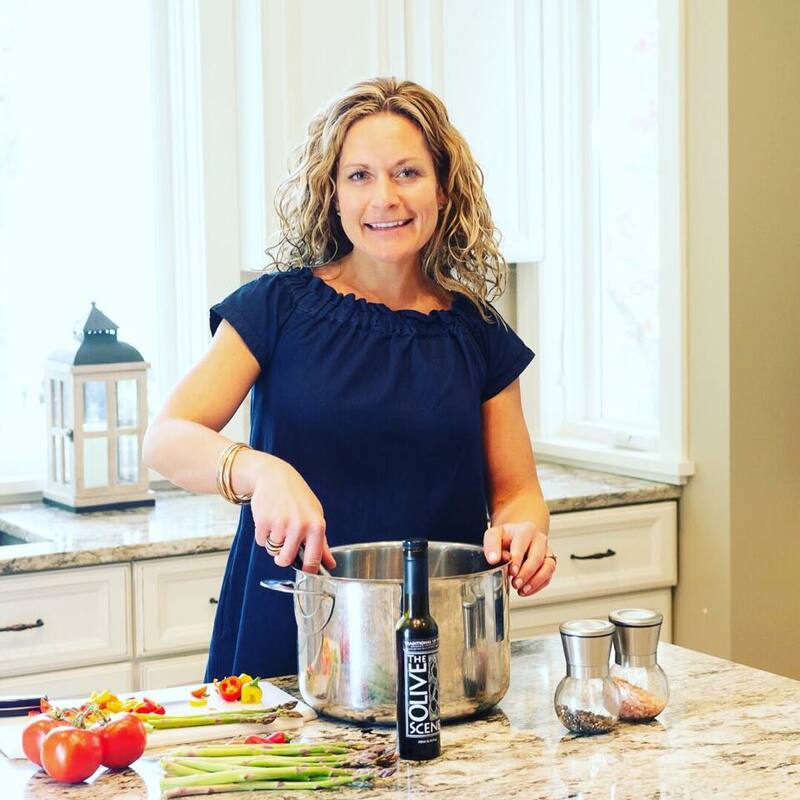 My favorite 6 ingredient recipe is for vodka sauce! It’s so simple and delicious you will never be tempted to buy it in a jar again! Melt the butter, add vodka and pepper, simmer 5 minutes. Add tomato sauce and cream, simmer 5 minutes. Pour over you favorite pasta and toss in the Parmesan cheese. This sounds great! 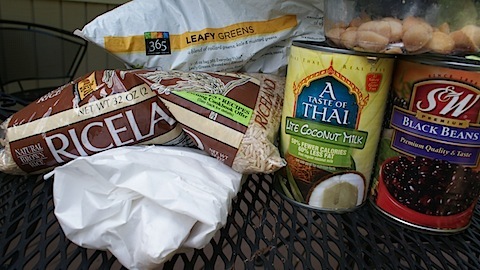 I have been a little intimidated about cooking with coconut milk, but I might just have to try it! My absolute favorite is a 6 ingredent recipe for “Lemon Garlic Chicken” that my mother always makes! Its very easy to make after a long day at work and is a great way to dress up plain old chicken breasts. I like to pair mine with roasted asparagus and brown rice! ***Heat EVOO in a large pan on medium heat and add the onions and garlic. Cook for about 3-5 minutes until onions and garlic are slightly transparent. Season the chicken with salt and pepper and add to pan along with the juice of one lemon. Cook chicken until done (time may vary)and add the juice of the other lemon over time as needed. This sounds so good! I can’t wait to try it! Thanks for the recipe! Great idea with the macadamia nuts! Breading with almond flour is also one of my personal fav’s! i swear i ate the most random things as it is just me in my apartment… heaven help the man that has to survive my “learning to cook” stage. Serve over whole wheat biscuits. This dish looks delicious – maybe I’ll love it as much as the spicy peanut vinaigrette you posted about! I love all the recipes people are posting – I’m definitely going to try a lot of them! My favorite 6 ingredient dish is not the healthiest, but I try to lighten it up. Perfect for Saturday college football games! Wow – this sounds amazing! 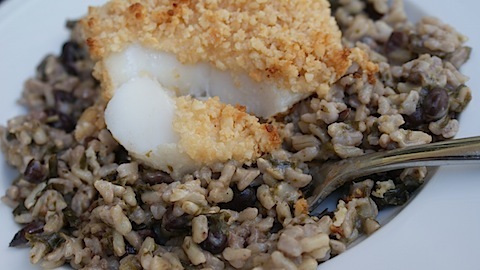 I’ve never made cod myself but this recipe is so simple and looks delicious! My favorite go-to 6 ingredient recipe is a Naan Pizza. Spread the pesto on the naan and arrange the toppings. Preheat your oven to 400 degrees and bake your naan pizza on a baking sheet for 7 to 9 minutes. Macadamia crusted cod??? Oh my goodness that sounds good! Remove the crust from each slice of bread. Brush each slice of bread on both sides with the soft butter. In a large muffin pan, place and mould each slice of bread in individual cups. Break a small egg in each muffin cup. Add dab of butter with a pinch of salt and pepper to each eggcup. Place in a pre-heated 350-degree oven until the eggs are done (around 10-15 minutes) to your liking. When eggs are done, remove from oven let cool for a couple of minutes. Remove from muffin tins and serve. That sounds incredible! Wish I had read this a few hours ago and I totally would have made it tonight! Halibut and quinoa was on my menu. Could have done this but with quinoa. Sounds so flavorful! Eggplant, marinara, parmesan, spinich, fresh basil, zucchini for a simple, healthy, fast veggie lasanga! Packed with flavor and looks pretty too. The coconut bean rice sounds really interesting…I’ve never tried those flavors together! oh wow this looks good. I can imagine the flavors together. Saving this to make! Quinoa salads are my favorite 6 (or so) ingredient recipes! Quinoa, feta, zucchini, lemon juice, cucumber, and bell peppers! Yum!!! I wonder how the crust would hold up for maybe tofu? I bet it’d work for seitan cutlets…I think any grilled veg salad works for a 6-ingredient or less meal – or tacos! This looks delicious. I love mac nut crusted anything! My favorite 6 ingredient dish right now is a combo of quinoa, 1 small can marinated artichoke hearts w/ juice, feta, sugar snap peas, cherry tomatoes, and a little lemon juice. Easy, delicious, and great for left overs. Gosh, that fish looks amazing. This rice sounds great Heather!! Anna would love it too! And I am with you on the salt! Lightly cook cabbage in pot of boiling water, ground turkey with garlic salt and pepper in pan, drain access oil. fill cabbage leafs with ground turkey mixture. Place bottom of roasting pan, repeat. Add tomatoe paste, water and saurkraut. Cook o 350 for 45 min. Thanks for the great recipe Cindy!